Scientists in South Korea have made ultra-thin photovoltaics flexible enough to wrap around the average pencil. The bendy solar cells could power wearable electronics like fitness trackers and smart glasses. Previously Nextbigfuture has reported on Japanese work to develop OLED displays that are only 3 microns thick. The one micron thick solar power technology would match up well with the three micron thick displays. 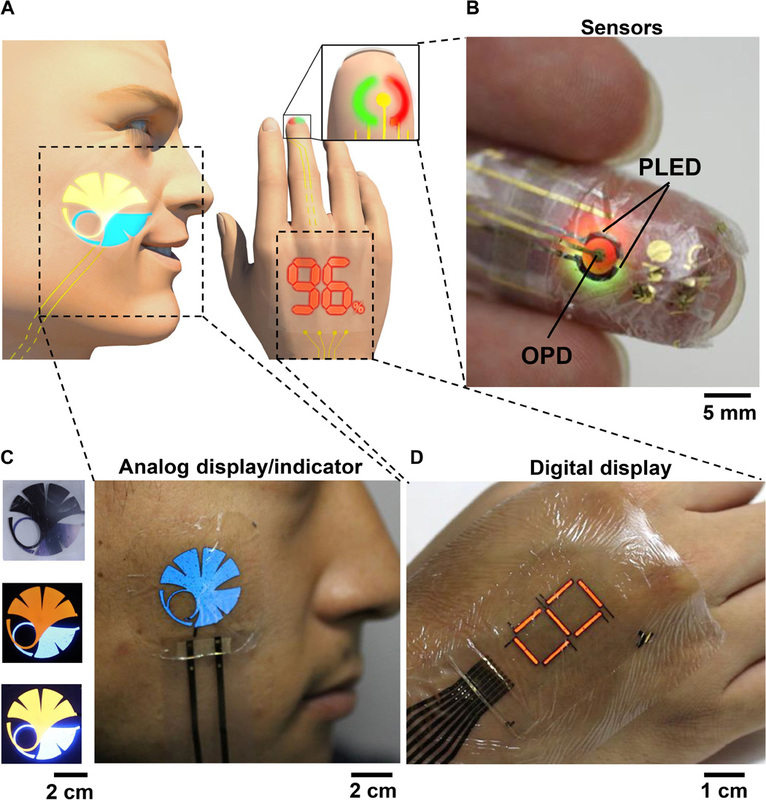 Tokyo researchers demonstrated ultraflexible and conformable three-color, highly efficient polymer light-emitting diodes (PLEDs) and organic photodetectors (OPDs) to realize optoelectronic skins (oe-skins) that introduce multiple electronic functionalities such as sensing and displays on the surface of human skin. The total thickness of the devices, including the substrate and encapsulation layer, is only 3 μm, which is one order of magnitude thinner than the epidermal layer of human skin. 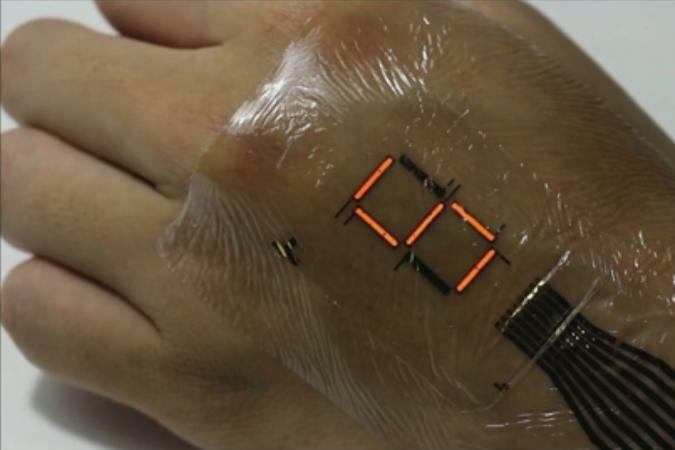 Smart e-skin system comprising health-monitoring sensors, displays, and ultraflexible PLEDs. (A) Schematic illustration of the optoelectronic skins (oe-skins) system. (B) Photograph of a finger with the ultraflexible organic optical sensor attached. (C) Photographs of a human face with a blue logo of the University of Tokyo and a two-color logo. The brightness can be changed by the operation voltage. (D) Photograph of a red seven-segment PLEDs displayed on a hand. earable flexible electronics often require sustainable power sources that are also mechanically flexible to survive the extreme bending that accompanies their general use. In general, thinner microelectronic devices are under less strain when bent. This paper describes strategies to realize ultra-thin GaAs photovoltaics through the interlayer adhesiveless transfer-printing of vertical-type devices onto metal surfaces. The vertical-type GaAs photovoltaic devices recycle reflected photons by means of bottom electrodes. Systematic studies with four different types of solar microcells indicate that the vertical-type solar microcells, at only a quarter of the thickness of similarly designed lateral-type cells, generate a level of electric power similar to that of thicker cells. 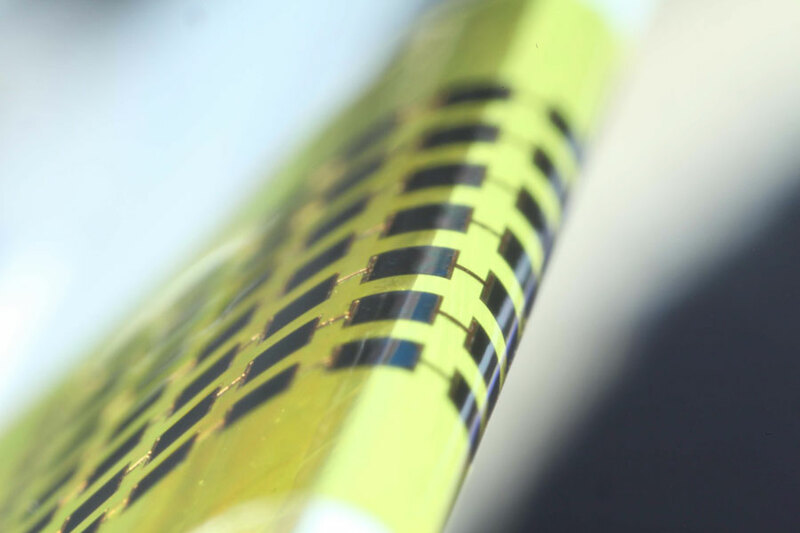 The experimental results along with the theoretical analysis conducted here show that the ultra-thin vertical-type solar microcells are durable under extreme bending and thus suitable for use in the manufacturing of wearable flexible electronics.